Ottawa – Lee Ann Napiorkowski’s commitment to volunteer coaching goes beyond creating a winning attitude with her players – she instills the key values of loyalty, equity and respect for their teammates and their community. 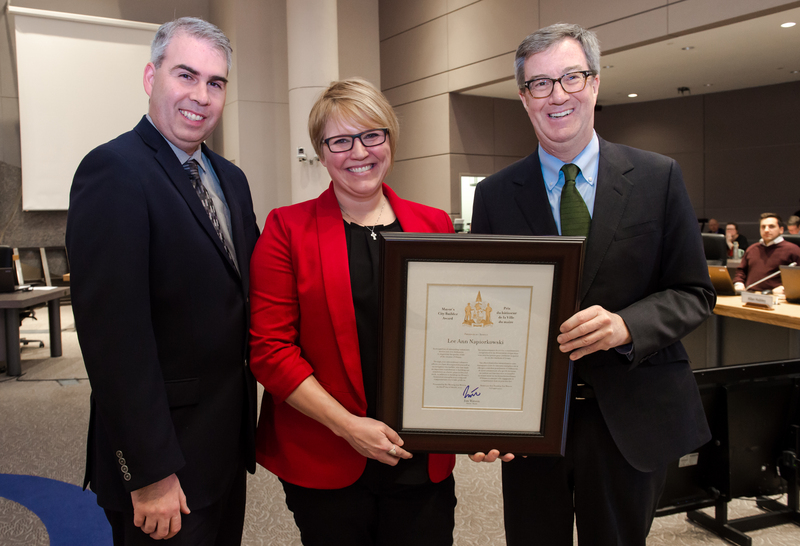 Mayor Jim Watson and Councillor Riley Brockington recognized her commitment and dedication by presenting her with the Mayor’s City Builder Award at today’s City Council meeting. The influence of respect, inclusion, and teamwork is derived from Lee Ann Napiorkowski’s work as an Inclusion Coordinator Teacher at St. Peter Catholic High School, which focuses the inclusion of high-needs students in every aspect of high-school life. At St. Peter’s High School, Lee Ann Napiorkowski also lends her leadership skills as head coach of the senior boy’s rugby team. Instilling winning and core values has translated into the team reaching several city championships, as well as the players’ participation in fundraisers and community charity events. In addition to the high school sport scene, Lee Ann has extended her volunteer head coaching to the Ottawa Beavers-Banshees Rugby Football Club and other provincial and regional teams, including the Carleton University men’s team. Her passion and commitment for inclusion and respect continued with her establishing an ambassador program that better connects the parent Beavers and Banshee Rugby clubs with junior players. Ensuring no player is ever left behind. Lee Ann has raised money for financially challenged players who could not afford registration and equipment. She even helped raised money for a player who qualified for the Eastern Ontario Championship, but could not afford the registration, equipment and travelling costs. Always ready to lend a helping hand, Lee Ann was asked by a family of a St. Peter’s student, who tragically passed away, to help establish a memorial award in their son’s name. With her dedicated efforts, the John Kelly Memorial Award and a rugby tournament in his name remain a living tribute to their son’s life, and help other students pursue their rugby dreams after graduation.